So, you have some good friends getting married. What will you be writing in your card to encourage them and offer words to say what you want to tell them for the rest of their hopefully unending marriage? That’s a lot of pressure. But we can take some of that pressure off by offering you this article to ensure that you are prepared for their wedding with an amazing card that will take their breath away and stay in their memory forever. Your good friends or work acquaintances will love anything you write, but with this guide you can pick the message that they will love the most and that will relate to your relationship to them and their personality the best. You can customize and mix and match these messages for the best results and for a vibe that feels tailored specifically to the couple you are trying to reach. Enjoy reading our funny section and bringing joy and laughter to your friends if that is the desired outcome. Move down to our religious section if you happen to know that they are religious and would love you to incorporate their religion into your gift and card. If neither of those sound like you or the happy couple are people you barely know, and you want to give them a card out of simple courtesy, then you’re looking for our heartfelt section. These cards brighten days and are written with very genuinely well-wishing words that show love and kindness. Funny: Here are the messages to write in your card that will make them laugh for years to come. (Name of groom here) and (name of bride here) sitting in a tree, K-I-S-S-I-N-G. First comes love, then comes marriage, then comes (name of bride here) with a baby carriage. Can’t wait to visit you in your suburb with your picket fence and minivan and watch you take the kids to school. (For groom) Don’t ever break her heart. Her dad will come for you. Religious: Remember, they love each other, but God loves them too. Show them that. “Let the peace of Christ rule in your hearts, since as members of one body you were called to peace. And be thankful. Let the message of Christ dwell among you richly as you teach and admonish one another with all wisdom through psalms, hymns, and songs from the Spirit, singing to God with gratitude in your hearts. And whatever you do, whether in word or deed, do it all in the name of the Lord Jesus, giving thanks to God the Father through him.” – Colossians 3:15-17. May you always keep this verse in mind as you start your new life in Christ together. “Wives, submit yourselves to your own husbands as you do to the Lord. For the husband is the head of the wife as Christ is the head of the church, his body, of which he is the Savior. Now as the church submits to Christ, so also wives should submit to their husbands in everything. Husbands, love your wives, just as Christ loved the church and gave himself up for her to make her holy, cleansing her by the washing with water through the word, and to present her to himself as a radiant church, without stain or wrinkle or any other blemish, but holy and blameless. In this same way, husbands ought to love their wives as their own bodies. He who loves his wife loves himself.” – Ephesians 5:22-28. May you both remember God’s instructions to you as you enter into this marriage. 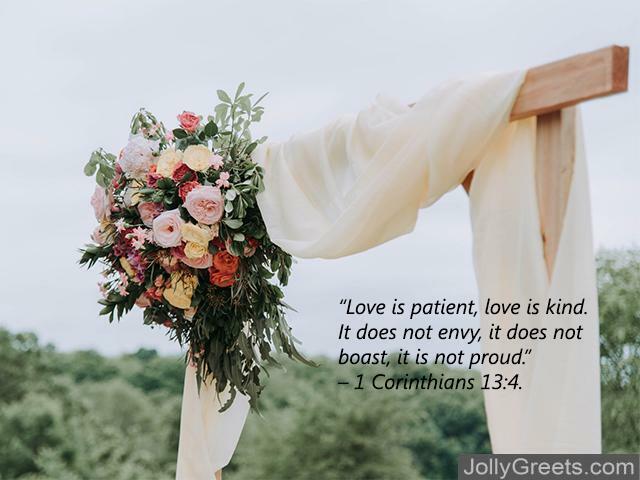 “Love is patient, love is kind. It does not envy, it does not boast, it is not proud.” – 1 Corinthians 13:4. “Two are better than one, because they have a good return for their labor: If either of them falls down, one can help the other up. But pity anyone who falls and has no one to help them up. Also, if two lie down together, they will keep warm. But how can one keep warm alone? Though one may be overpowered, two can defend themselves. A cord of three strands is not quickly broken.” – Ecclesiastes 4:9-12. Always remember that 2 is better than one. May you remain 2 for many years to come. 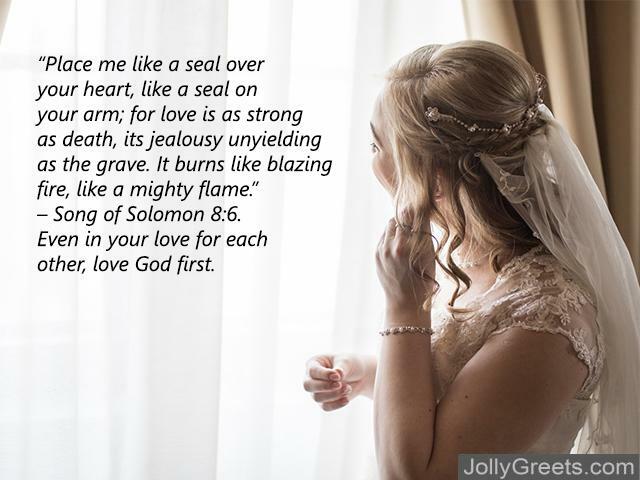 “Place me like a seal over your heart, like a seal on your arm; for love is as strong as death, its jealousy unyielding as the grave. It burns like blazing fire, like a mighty flame.” – Song of Solomon 8:6. Even in your love for each other, love God first. ““So they are no longer two, but one flesh. Therefore what God has joined together, let no one separate.”” Matthew 19:6. You are joined by the Lord into one flesh. Let God be your guide in this marriage and never lose that bond. Heartfelt: Here is where you’ll find more personal messages to write so that they’ll always know how much you love them and are rooting for them. Don’t forget how you feel today, because there will be a lot of days to come that you’ll wonder why you made this decision. It’s because of that feeling. May you always be this in love and feel this connected. Getting married is the easy part. 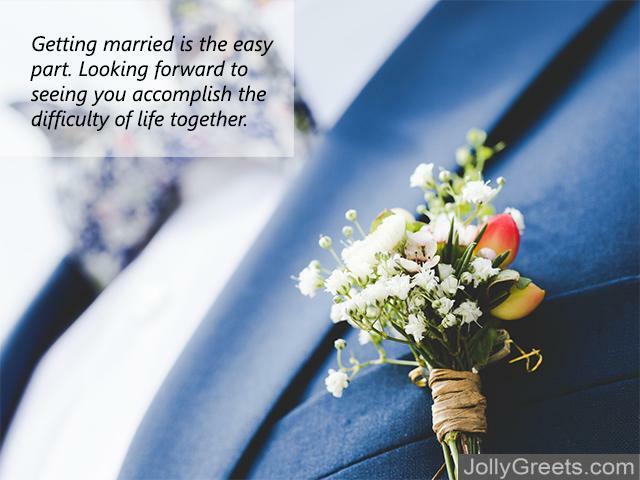 Looking forward to seeing you accomplish the difficulty of life together. It’s difficult, but take it from your friend, it’s worth it.